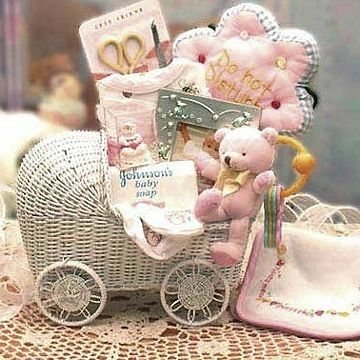 Send this special baby carriage! Bundle of Joy Baby Carriage. This ever so special gift is filled with all the baby items we find so irresistible! You may choose pink or blue on this item and it is sure to be well received by all. This gift includes the following: Wicker white baby carriage,"Do Not Disturb" Baby Door Hanger, 3x5 silver baby frame, Soft Plush Miniature teddy bear,Baby manicure set, Terry Cloth Burp Cloth, Baby teething keys, Baby Booties, 100% Cotton One piece snap Tee Shirt, Johnson & Johnson Baby Bath Soap, and Miniature sugar baby.